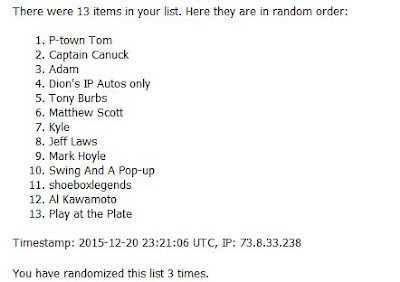 We'll start off with a little visit to Random.org as we have two large staccks of UD Hockey to hand off. Remember, we are looking at the person at the top, and the person at the bottom. So we have one stack heading to Peoria and the other to the Lone Star state. Congrats to you two. So what's on the random block today? The star is the center pile - 2015 Stadium Club. Three dozen cards from this year's release. I'm going to team it up with some Opening Day and Diamond Kings - like 30 of the first and 15 of the latter. I lucked out and won a box of Opening Day at me LCS, so I built the entire base set - these were the dupes from the box. DK - I really need to get a box of that. It's a decent fill in for my Cooperstown fix. Comment box below. Let me end the bottom of this post as a thanks to another package I received recently. Fuji, from the fantastic Chronicles Of Fuji, makes me the dumping ground for all hits Hawks and White Sox. And that works, cuz I have made him my dumping ground for all hits Sharks and Padres/A's. And what was the latest mailing from Fuji? 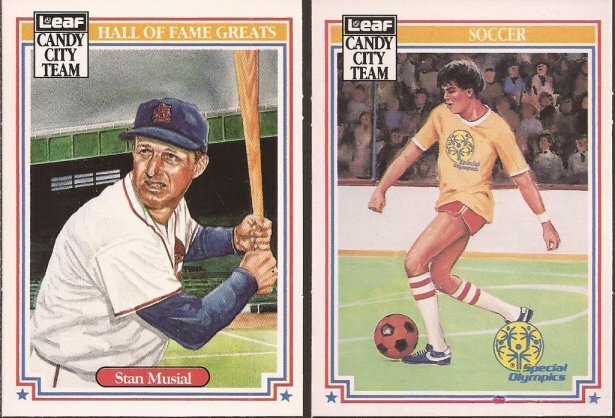 We start with this really neat Leaf set that commemorates both baseball stars and the Special Olympics. I think the story was Fuji found a couple sets at the flea markets he attends (San Jose flea markets are the best in the world I have determined) and offered a set in a contest. Fortunately, I ended up at the top. While the cards are simple and very Diamond King like in the look, they are really great to look at in hand. "But the hits, Jeff. You said Fuji dumps hits on you." Yes - I did say that, and he did do that. 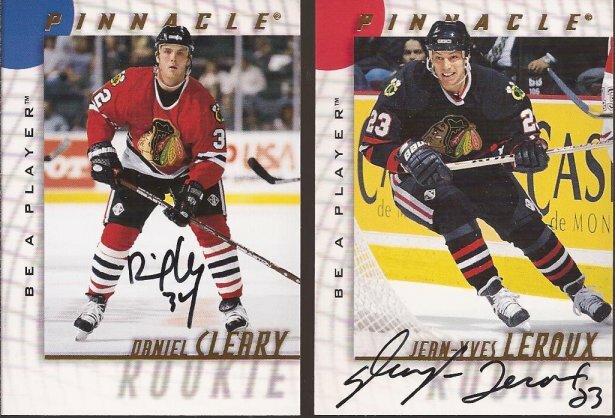 Two Hawks that did their best to make the team something feared in the late 90's. 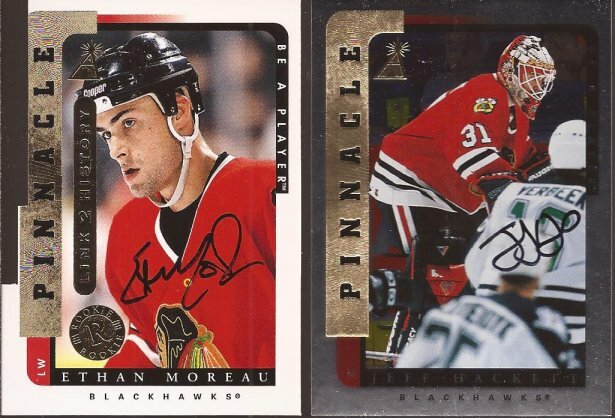 Moreau you a high draft pick for the Hawks and did well for a few seasons before an out of the blue trade with the Oilers where Edmonton definitely got the better end of the deal. Hackett was Belfour's backup for a few years and then the full time goalie after Eddie's trade to the Sharks. I'm not sure the Hawks autograph run in Be A Player, but Fuji is going to send me the full set series at this rate. Cleary - I think I have spoken about the mistake of trading him in the past, so we'll not beat that dead horse, though he left Chicago in the same trade with Moreau above. Leroux was a 2nd round draft pick that never really found his scoring touch in the NHL, playing most parts of 4 seasons. Just 16 goals and 22 helpers in 220 games in the Indian head. Last card from Fuji, and talk about clubbing. 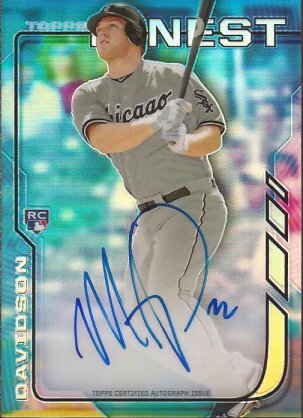 This Finest refractor autograph is all the colors of the spectrum. With the recent pick ups of Frazier and Lawrie, Davidson will probably move to a utility role in 2016, but he still has youth and could find some time at shortstop, splitting time with Saladino. Thanks as always, Fuji. I'm sure I'll be dumping on you soon enough. I'm in it till I win it! Building the Stadium Club set so those would be great to fill in the holes! In for the Stadium Clubbin, that Finest auto is sure is purdy.